400m “moving-up-to-the-800m-man” Martyn Rooney (45.35 – 2006 World Junior Championships Bronze Medalist and British junior national record holder). Hurdle mobility drills that work through range of motion with lead and trail legs. Technical Conditioning: Dakin begins with postural drills that are designed to strengthen the core and to keep the athlete "tall" at all times. Technical drills: Dakin focuses on isolation drills with a progression that includes side step drills, full hurdle short stride drills, alternating lead right and lead left and a one-step drill. Spatial Awareness drills: Dakin’s focus is creating athlete awareness for coming into and away from the hurdles. Bend Drills: Dakin offers drills and strategies for maintaining technical control on the bend. As well, Dakin’s instruction is applicable for the 300 meters Intermediate hurdles for Youth and Masters. 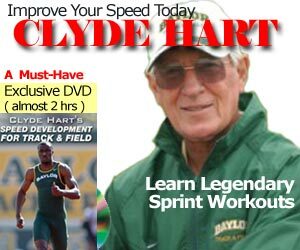 This video is 27 minutes long and produced in 2009.
strength and power development for long hurdlers. If you are a hurdler or hurdle coach, you definitely do not want to miss this outstanding interview with one of the top long sprint coaches in the world. Best of all, it’s free by going to the Canadian Athletics Coaching Centre website or using the built in Player below.